Not even a brown bag is basic when it's created by Kathy Van Zeeland. The flamboyant designer stamps her inimitable style on this Boom Shaker shopper. The name should clue you in; this shopper packs quite a punch. Rounded off pyramid studs and tiny round nailheads extend down from the shoulder straps. All that metal was probably enough, but Kathy Van Zeeland has never been a designer who knows when to say no. And so she adds tassels. And then she adds studs and rings to the tassels. Throw in some pleats for good measure and you've got one overwhelming handbag. The purple tiger stripe lining looks like it's ready for fun, but the Boom Shaker's interior is actually pretty smart. There's a large zippered compartment, and magnetic closure sections on either side of it, so keeping the Boom Shaker organized is pretty easy. In addition to the open and zip pockets we've come to expect, Kathy Van Zeeland has also added a pair of card pockets. What a great idea for a purse that will spend much of its time hitting the mall! The Boom Shaker will be too much for conservative fashionistas, and too tacky for luxury lovers, but Kathy Van Zeeland has still earned her $99 here. 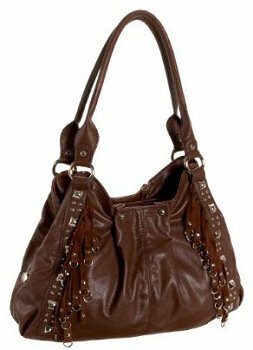 The Kathy Van Zeeland Boom Shaker hobo bag, a great alternative to this shopper bag.